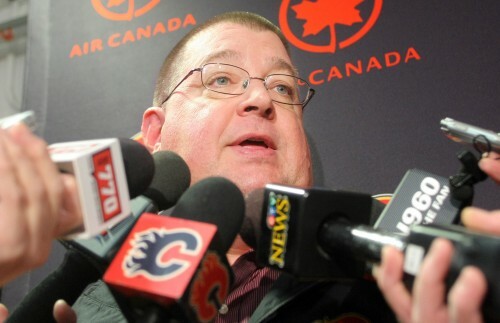 The Calgary Flames have fired general manager Jay Feaster. It was announced on the team’s website that Director of Hockey Operation, Brian Burke, had relieved Feaster and assistant GM John Weisbrod of their duties Thursday. Burke said he is going to serve as the interim GM until he hires a new manager, a process he says that he has already started. He says he has “already asked for permission to speak to one candidate” and also said he going to ask for permission from other teams to speak to other candidates later today. Nick Kypreos of Sportsnet said that the Leafs were not the one team that Burke had asked permission of to speak with a candidate. Burke went on to say Feaster was “a good man” and that it was “hard to fire a friend” but he still had to make the move. When asked why he made the moves now, Burke said it was part of a long process. 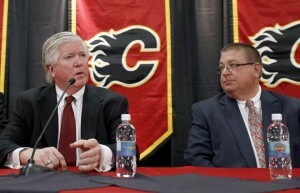 Brian Burke and Jay Feaster at the press conference announcing Burke’s hiring as Director of Hockey Operations on Thursday, Sept. 5, 2013. One of the reasons he came to that conclusion appears to be the Flames recent drafting (asides from Monahan, who Burked said was a “home run”) and trades. The most obvious example of this would be the Jarome Iginla trade; with many believing the Flames were fleeced in the deal and should have received better compensation. Burke said there would be “no further changes” and that the coaching staff was safe for now and promised them they would finish the season. He did say they would be subject to the new GM’s approval for next season. Feaster was hired in 2010 as assistant GM before being named interim GM later that year when Darryl Sutter was fired. Feaster was later promoted to full-time GM status before the beginning of the 2011-2012 season. Feaster was in the last year of his deal. As for qualifications for the new GM and assistant, Burke said they would need to be proven in the draft, which he said is of vital importance. He also said he wants someone to build a team the way he thinks it needs to be to win, and used a word many media members and Toronto Maple Leafs fans are familiar with. The Flames are 13th in the Western Conference this season with an 11-15-4 record and haven’t qualified for the Stanley Cup Playoffs since the 2008-09 season. The Flames host the Carolina Hurricanes on Thursday night.